Tip of the Day: …..drumroll…..elissa please email your full name and mailing address to author2author(DOT)blog(AT)gmail(DOT)com. Because yes, you are the winner of IT'S NOT ABOUT THE ACCENT. Congrats. For those that didn’t win, you are in luck because we have another giveaway going on right now! Just leave a comment to this post for your chance to win! Today is a super special day. Not only do we have another Sharing the Love book to give away (Who doesn’t love a giveaway? Aren’t they the coolest? 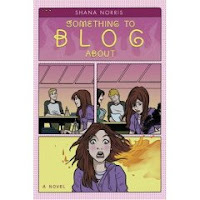 ), but we also have an extra special visit from another author: Shana Norris. Shana has agreed to not only tell us about her book SOMETHING TO BLOG ABOUT, which you can win today, but also share some tips for all the authors out there. Shana doesn’t know it, but for agreeing to do this, I am even giving her an honorary Miss name of Miss Awesome Author. So without further ado here is the lovely and talented Shana Norris to tell us about her new book that you can win, which just hit shelves a little over a week ago. First, Shana thanks for stopping by. We are really glad to have you and appreciate you taking the time to answer our questions! Thank you for having me here, Emily! Something to Blog About is a humorous young adult novel about fifteen-year-old Libby Fawcett, who has a reputation for getting into embarrassing situations. At the beginning of the story, she has a mishap with a Bunsen burner and sets her hair on fire—in front of Seth, the guy she’s had a crush on since eighth grade. So Libby decides to start a secret blog to write about all the traumas of her life. She never intends for anyone else to ever read the blog, but then it gets posted throughout her school and everyone reads her secrets as well as her friends’ secrets too. I loved Libby’s voice. She’s a fun perspective to view the world from because she’s overly dramatic as well as being klutzy. I also really liked developing the relationships between Libby and the other characters, especially Libby and her mom, and Libby and Angel. How many books did you write before Something to Blog About sold? I’ve been writing since I was a kid, so I’ve written A LOT of books during that time. But they were all really bad, so I don’t count them! From the time that I decided to seriously pursue publication, I wrote four books before SOMETHING TO BLOG ABOUT. But STBA was my first YA. Before that, I thought I would become a fantasy writer, which is what the four books before STBA were. I still love to read fantasy, but I’m not very good at writing it! I never had any luck getting my fantasy stories published and never even got any interest at all from agents for my fantasy books. But with STBA, I got several requests for partials and fulls, and then was offered representation 11 months after I first started querying for it. Then seven months and a lot of revisions later, we had a pre-empt offer from Amulet Books. What's one piece of advice you’d give the people reading this blog in each of those stages? For those in the Writing Apprentice and Awaiting an Agent stages: Not everyone is going to realize your brilliance the first time you send out queries. LOL. Seriously, you’re going to get rejections. Even bestselling authors have been rejected at some point. Just keep trying! For the Recently Repped: It doesn’t get any easier once you have the agent. There is still a lot of hard work to prove yourself in this business and there will probably be times you feel like crying and giving up. Don’t give in to those feelings! To the Soon-to-Pub: Learn all you can about paying taxes on your advance so you understand exactly what you need to do! Seriously!! And to Pinch Me I’m Pubbed: Don’t let the bad reviews get you down. One way I’ve figured out to make me feel better when I get a not so great review is to go to Amazon.com, look up a best-selling author, and then read all of her one and two star reviews. It always cheers me up to know that even best-selling authors get bad reviews. Can you tell us more specific information about the love interest in your book? Libby’s love interest is a cute, quiet guy named Seth. She’s been in love with him ever since the eighth grade, when they had to work on a class project together. But Libby has never had the courage to talk to him, so she admires him from afar—until the perfect opportunity to get close to him lands in her lap and she can’t pass it up. Seth is a bit of a mystery to everyone at Libby’s school. He doesn’t have a lot of friends and usually keeps to himself. No one knows too much about him because he hates being part of high school gossip so he keeps his personal life as secret as he can. If you could cast any Hollywood actress/actor, entertainer, model, or other personality to be the main characters of your book, who would you choose? We would all be in trouble if I was in charge of casting a movie version of SOMETHING TO BLOG ABOUT because I have a hard time choosing any actors that I think fit the roles! LOL. But I could see Amanda Bynes as Libby, since she’s got that cute, bubbly look about her. And Michael Cera as Roger. Maybe Vanessa Hudgens as Angel. But I have no idea who would play Keisha or Seth! If you could switch places with any other author who would it be? Meg Cabot! I’d like to spend the day in her head and find out how she writes such hilarious books. And finally, if you could go on vacation tomorrow, where would you go? My husband and I are really into history and I love Greek mythology, so I would love to go to Greece and see ruins of ancient cities and temples. Thank you so much Miss Awesome Author Shana. We all really appreciate you stopping by and sharing with us today. For those out there that what to show Shana some love, they can visit her Web site at: www.shananorris.com to learn more about her or her new book. And please, please don’t forget to leave a comment, either here or on our LiveJournal feed, for your chance to win your very own copy of Something to Blog About. Comments have to be in by the end of the day (midnight EST). And if you link or have linked to author2author.blogspot.com in your blog or Web site, let me know where in your comment (even if you told us yesterday, please let us know again) and you get two entries. Deena will announce the winner tomorrow in her post, which I caught a glimpse of and it’s about boys (which I am super excited about because I love hearing about boys!) 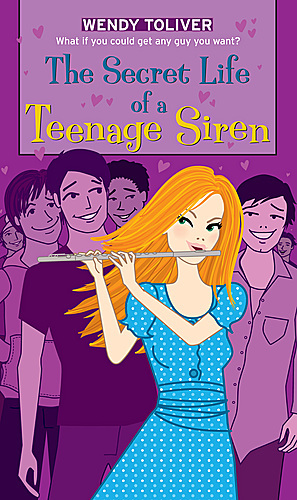 and you can win a copy of The Secret Life of a Teenage Siren. So make sure to check back to see if you won! Thanks for stopping by Wendy, and I'm excited because people have a chance to win your book tomorrow. Yay!!! Yes! I'm very excited and flattered. Thanks! I'll post a link from my blog. Count me in on this one, Gals! Shana, it was great to hear your story and I love Amanda Bynes! She would be an awesome leading lady. I'm in the "on the bubble" stage, and I hope to go into more detail later, but not now. Excellent interview, Shana and Em! I know I can't win, but I am so getting my hands on STBA! Congrats again to Shana on the book! Enjoyed reading this interview :)! Another great book and author! Do our comments count for the drawing if we post on the Live Journal syndication? I just posted there and blogged about the contest on both my Live Journal and Blogspot sites. Covering all my bases, hee hee. This book sounds terrific! Count me in! And I mentioned the giveaway on my blog, too! Thanks everyone for entering. Good luck!!! louis vuitton bags will surely look good on just about anything, and can be used from day till night while on a little get together party. This Monogram Vernis is in blue galactic, pink and sunset orange colors, which are both striking and stylish looking. Each of Monogram Watercolor carries a tag of $855, which is somewhat low-priced for such Patent leather handbag. When’s the right time to query? The Share the Love Giveaway Starts Here!! Who Do You Let Read Your Stuff?